We are counted among the leading manufacturers, distributors and exporters of Calamine. 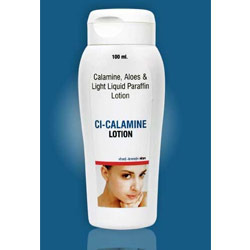 The range we deal in includes CI Calamine Lotion, which is suitably used for treating various skin related problems. Processed using high-grade ingredients, these products are highly effective in reducing acne, hence making skin fair. We provide these products in tamper proof packaging, ensuring their safe transit to the clients' premises. Clients are facilitated with a vast variety of CI Calamine Lotion, which is processed under the able guidance of dexterous professionals. We maintain highly hygienic atmosphere at our premises so as to ensure safe processing of our products. Our range is clinically tested and ensured for safe usage for treating various skin problems. Also, this lotion possesses the ability to soothe irritated skin. Pack: 3100 ml Pet Bottle-M.C.